Google recently released a new version of our Google Chrome browser with Adobe Flash Player built in, automatically bringing you the latest and greatest updates. 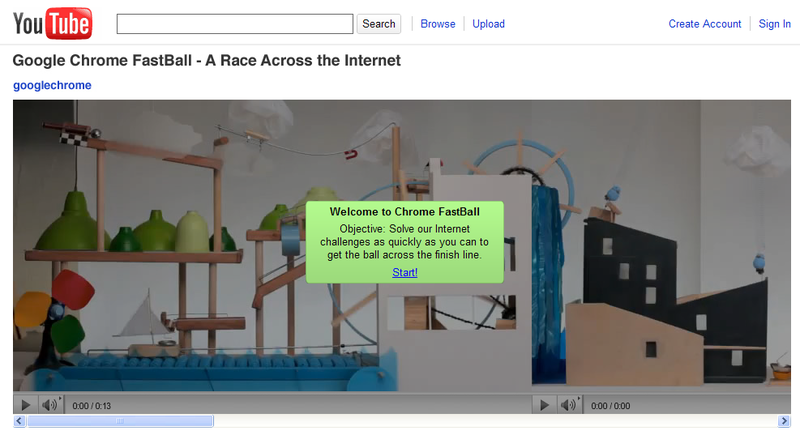 To celebrate, we teamed up with a few creative folks to make Chrome FastBall, a Flash-based game built for YouTube. Want to race? Try your luck with Chrome FastBall, and if you haven’t taken Chrome for a test drive yet, download the newest stable release of the browser at google.com/chrome. Update 7:20PM: All technical issues have been resolved now, so you can enjoy the game. Thanks for your patience! Update 9:22AM: Due to the overwhelming response to the game, some things aren’t quite working as we hoped due to server-side overloading. Please forgive the maintenance work as we get the game back up again. Thanks!